Terry the turkey loves to explore. One day he makes a new friend — but will he be dangerous? Students will read the passage and answer follow-up questions about character and other story elements. Terry the turkey was very brave. The turkey flock usually stuck together, with all of the younger turkeys lining up to follow an adult as they made their way around Farmer Gregory's fields. Together, the turkeys scratched in the dirt to find bugs and seeds to eat. "I'm not hungry," said Terry. "I'm bored. I'm tired of walking around the field all day." And with that, he set off toward the fence at the edge of the farm. Terry hopped up on the fence and looked back at the flock. None of his brothers or sisters had followed him. He was alone. Terry jumped down to the ground on the other side of the fence. He kept walking. Soon the green grass was gone and the ground turned hard. It was black. Terry was crossing the street! A big yellow school bus rolled up to Terry. It stopped and waited until Terry was out of the street. Then it continued on its way. The children on the bus all waved at Terry. Terry walked into the grass and up a small hill. At the top of the hill was a blue house. There was also a flower garden and a swing set. Terry waddled over to the swing set. When he got closer, he saw that there was a boy sitting on one of the swings. Terry came closer. He had always been interested in people, but the other turkeys were afraid. "Hi!" said the boy. He began swinging higher and higher. "I can almost fly!" Terry thought that looked like fun. He could fly a little bit, too. Terry hopped and flapped his wings to show the boy what turkey flying looked like. The boy laughed. Terry gobbled. This was fun! Soon the boy slowed his swing and stood up. "I have to do homework now. Bye!" And he ran into the house. Terry looked at the sky, which was beginning to turn pink on the horizon. Soon the flock would be hopping up into the trees at the edge of the field to rest for the night. Terry walked back down the hill, crossed the street, and jumped over the farm fence. Some day soon he would come back to see his new friend, but for now it was time for bed. 1. How does Terry feel about the farm field? 2. 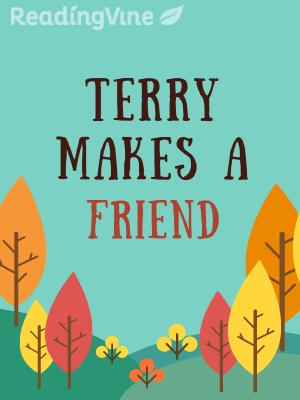 How does Terry make friends with the boy? 3. How would you describe Terry's personality? 4. Do you think it was safe for Terry to set out on his own? Why or why not?